Home Grapeland Family History Darsey, George E. Sr.
George E. Darsey, Sr. came to Texas without capital and started his career in this state as a farm worker. He was born in HenryCounty, Georgia, December 9, 1860. His father, George M. T. Darsey, was a native of Spaulding County, Georgia, and lived all his life in Spaulding and Henry counties of that state. He was a planter in Henry County at the outbreak of the Civil War, and soon afterward enlisted in the confederate army. He died as a result of wounds received on the battlefield in the last year of the war. He married Nancy Enloe and they had three children. Nancy Enloe was born in Coweta County, Georgia. She died in 1873. George E. Darsey grew up in the most difficult period of the South, being a child when all the resources of his home state were engaged in waging war, and about the time he was old enough to attend school the blight of reconstruction deprived the southern people of opportunities to resume their normal life. He had such advantages as the common schools could confer, seven years, and when in 1878 he started for Texas he brought with him an experience of farm work and only twenty-five dollars in money. For two years he worked for wages on a farm in Houston County, then carried a mail route and supervised a plantation. He also clerked in a general store at Crockett and this laid the foundation of his business training. An important element in his successful career was the habit and rule he formed many years before and to which he closely adhered, requiring that he save a part of his earnings regardless of the amount he was getting. In that way while his knowledge of business was growing he was also laying aside a small capital and in 1883 he acquired a partnership in the mercantile firm of John R. Foster & Co. at Grapeland. In 1886 he bought out the store as George E. Darsey. His store continued under this title until 1917 when he brought other family members into partnership with him. The name was then changed to George E. Darsey & Co. George E. Darsey & Co. was operated as a general store with many departments of special services. George Darsey was always recognized for his close relationship with the welfare and progress of the agricultural community of which Grapeland was the center and made his business a center of service in more ways than one. The company bought a large share of the cotton rose in this section, afforded a market for eggs and poultry from the farms and through close contact with the farmers was influential in securing greater diversification of crops, so as to add to the total earnings of the farm. His business advocated the grading up of livestock, the raising of sheep, the use of improved fertilizers, and the introduction of progressive and modern methods of cultivation and marketing. George E. Darsey was one of the organizers of the Farmers and Merchants State Bank of Grapeland, which was established in 1906, and he was the president of this bank until his death in 1930. He also served as mayor of Grapeland from 1926 until 1930 and was very active as a civic worker and in behalf of educational and religious movements. He was a steward in the Methodist Episcopal Church for thirty years and was instrumental in helping build the now existing Methodist Church. He was a member of the East Texas Chamber of Commerce and was noted for his support and advice in helping other business groups to successful business enterprise. On December 10, 1888 George E. Darsey married Miss Lorena Elizabeth Murchison, daughter of Murdock K. and Elizabeth (Driskell) Murchison. 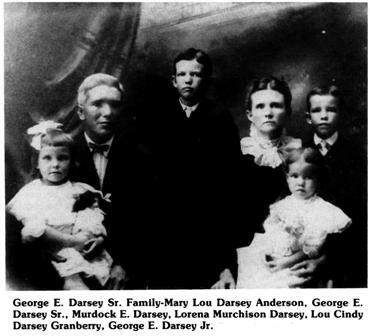 To this marriage were born six children: Murdoch E. Darsey who married Luna Frank Hollingsworth; Willie Co Darsey who died at the age of eleven; George E. Darsey, Jr. who married Margaret Josephine Combs; Mary Lou Darsey who married Leon Anderson; Lorena Elizabeth Darsey who died as an infant and Lou Cindy Darsey who married Frank Granberry. The history of each of the children of George E. Darsey is included in this book under separate headings. Next articleDarsey, George E. Jr.